LANGUAGE - Language stimulation is developed on all levels from letter recognition to reading readiness. A child's interest and skills are developed through the use of puppets, flannel boards, library, vocabulary and writing activities. MATH - Using familiar manipulatives and activities, teachers develop basic math concepts, stimulating a child's inquisitiveness by means of sorting, counting, problem solving, and patterning. As a result, math is made more meaningful in real life problems and situations. SCIENCE - Simply put, our teachers use a hands-on approach. A wide variety of topics are taught including: seasons, our world, "all about me," etc. Projects and experiments extend the learning program stimulating excitement through observation using the senses of sight, sound, taste, and touch. SPANISH - Children, aged 3 and over, will be able to recognize numbers and colors by using the language and they are encouraged to speak in basic phrases. This introductory curriculum includes greetings, seasons, shapes, clothing, names, identification of everyday objects and other basics. COMPUTERS - Age appropriate programs are used to teach basic skills. The use of specialized computer software reinforces all areas of curriculum as well as eye-hand coordination and fine motor skills. LIBRARY - Appreciation and enjoyment of reading are developed through daily group reading, with recognition of authors and their writing styles. The children have a once-a-week visit to the in-house library. MUSIC - Music activities help the child to hear differences in sounds, discover rhythm, and develop movement skills and spatial awareness. 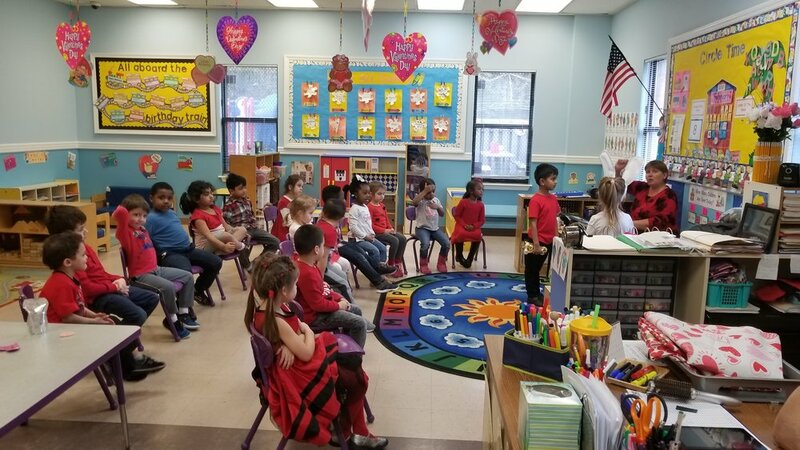 There is a once-a-week structured class in music plus in-classroom sessions where songs are used to enrich the learning experience in areas of concept and language development. SPORTS - Introduction to various sport activities are provided as enrichment programs. CONSTRUCTION - Children use their creativity by using blocks, trains, trucks, cars, etc. to develop fine motor skills. SENSORY TABLE - This center stimulates their sense of touch by using a variety of different materials. IMAGINATIVE PLAY - Children are encouraged to use their imagination. Dress up clothes, costumes, puppets, dolls and other props are provided. MANIPULATIVES - Small "hands-on" activities promote hand-eye coordination. GYM ACTIVITIES - Social, teamwork, and gross motor skills are enhanced through our structured, instructor-led gym activities. ART - We encourage free art expression as well as participation in structured art projects.